Birth certificates, passports, citizenship papers: these are the documents that define our official identities, that make us legible to the apparatus of the state. For Asian Americans, such documents are often central to our family narratives, marking a history of migration, departure and arrival, rejection or belonging. Yet we are also well aware of what such official documents erase, enforce, or repress. 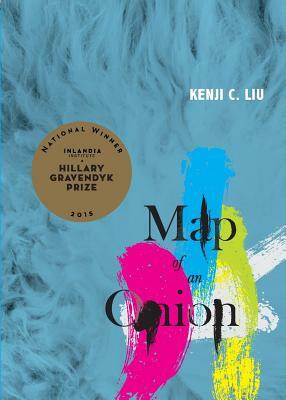 Kenji Liu's Map of an Onion begins with a reflection on the role of such documents in shaping identity but the mapping Liu offers us in this collection rejects the sharp boundaries of the official cartographer. Instead, Map of an Onion is a border-crossing, coalitional text that finds its political voice in interruption. In Liu's poetics, family history structures, and is structured by, histories of migration, colonialism, and violence, yet Liu finds in the interstices of those structures a space of profoundly personal exploration. "Tell me how to say your name," he asks us, "because / documents won't protect us." -- Timothy Yu, Author, 100 Chinese Silences and Race and the Avant-Garde: Experimental and Asian American Poetry Since 1965 One way to read Map of an Onion is as a quest myth for the contemporary self-discovering, revealing, asking deeper, inquiring layer by layer toward the onion's core, which is, ironically, unlocatable. Self as sensorium of perception, self as "animal, bird," as family member, as the inheritor of eight centuries of Liu heritage, self as man, as Japanese-Chinese-Taiwanese-American living on borrowed Lenape Native land in a suburb of New Jersey, self as unstable construct, as citizen, diplomat, flaneur, saboteur, artist, as tech-savvy, code-switching trans-lingual being. Kenji Liu's illuminated Map of an Onion is a koan of deconstructions which interrogates within the fissures of difference those spaces within us and between us, as charged spaces of potential and becoming. A booklength question in a hard, graceful calligraphy, asking deeper, asking better, what does it mean to be a self, this Self, to "translate this search / between my family's four languages,"-emergent, reassembled of ancient molecules and sculpted by all the forces of culture, history and bloodlight into a man? If "nations need a parable to reinvent themselves," Map of an Onion may be that parable. -- Chad Sweeney, Hillary Gravendyk Prize Judge.